The exhibition Tradition, Trauma, Transformation: Representations of Women opened on March 26th at Brown University's David Winton Bell Gallery. The exhibition features the work of three contemporary Indian and Indian-American artists: Nalini Malani, Nilima Sheikh and Chitra Ganesh. With an overarching theme on sexuality and the position of women, the artists works explore contemporary Indian politics, religion, and culture. Artist Nilima Sheikh is influenced by Indian traditions and the ability to recreate these traditions. Her piece in the exhibition, titled Shamiana, is a series of six hanging scrolls that depict "scenes of life and love drawn from legend, literature, and life." Shamaiana are traditional tents used for ceremonies such as weddings, parties, and feasts. Using a similiar material as the tents, the scrolls are painted on calico cloth with tempera. Born in Karchi, Pakistan in 1946, artist Nalini Malani entered the world at a pivotal time in Indian history. A year later, with the Partition of India, Malani would become a young refugee in India. Malani's work uses this experience as inspiration for her artwork. The exhibition includes two of her videos, Memory: Record/Erase and Unity in Diversity. 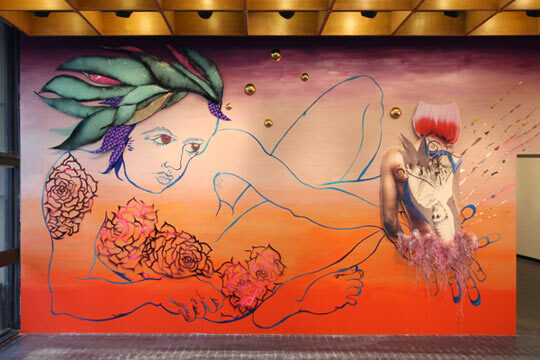 The youngest of the three artists and a graduate of Brown University, Chitra Ganesh created a site-specific wall drawing in the lobby of the List Art Center and also exhibits three prints from her series titled Melancolia. Having been born in the United States, Ganesh's work is influenced both by her home land in the far East and her birth place in the West. Her work is often "characterized by complex iconography and psychedelic colors." The exhibition's offical reception is Friday, April 8 from 5:30 to 7:30pm and the work will be on display until May 29th. The David Winton Bell Gallery is free and open to the public. Visit their website to learn about their hours, location, and past exhibitions.